Six Super PACs Reported Spending At Least $1 Million To Influence Michigan Races For The U.S. House In 2018, According to Campaign Finance Disclosures. LANSING (Jan 24, 2019) — About 20 percent of the money in Michigan’s 2018 U.S. House races flowed through just 10 political action committees (PACs). Some of them were funded by the same large donors, and all of them were based outside of the state. Those 10 PACs combined to spend $17.1 million on Michigan’s U.S. House elections last year, according to a review of campaign finance disclosures. The races attracted about $80.0 million overall through candidate fundraising and independent spending by PACs, super PACs and other groups. Among the 10 PACs were eight super PACs. Super PACs can accept unlimited contributions directly from labor unions and corporations. All of the PACs could accept unlimited contributions from individual donors and could spend unlimited amounts to influence races as long as they didn’t coordinate with the candidates on the spending. According to the disclosures, no individual donor may have had a larger impact on the Michigan U.S. House races than former New York City Mayor Mike Bloomberg, the founder of Bloomberg LP. Bloomberg was the top donor to three of the 10 PACs that spent the most on Michigan’s U.S. House elections last year. He was one of the five largest donors to two other PACs that were among the top 10, according to a review of disclosures. According to campaign finance disclosures, Bloomberg was the primary funder of the Independence USA PAC, which collected about $60 million from the start of 2017 through the end of 2018 and spent money on races across the country. 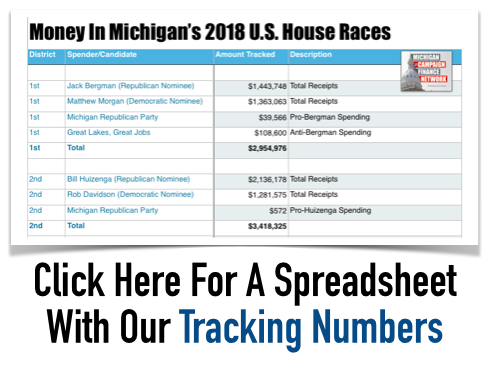 The PAC was the biggest overall spender — other than individual candidates’ campaigns — in Michigan’s 2018 U.S. House races. The super PAC reported spending $2.6 million in support of Democrat Haley Stevens of Rochester Hills in the 11th District race and $2.4 million in support of Democrat Elissa Slotkin of Holly in the 8th District race. Both Stevens and Slotkin won seats that were previously held by Republicans. But Bloomberg wasn’t the only donor who helped fund multiple PACs heavily involved in Michigan’s 2018 races. Nevada casino owner Sheldon Adelson and his wife, Miriam, were the top donors to two super PACs that spent heavily to support Republicans in Michigan’s races and races across the country.The Adelsons gave $10 million to America First Action, a super PAC, and $50 million to the Congressional Leadership Fund, another super PAC, according to disclosures. 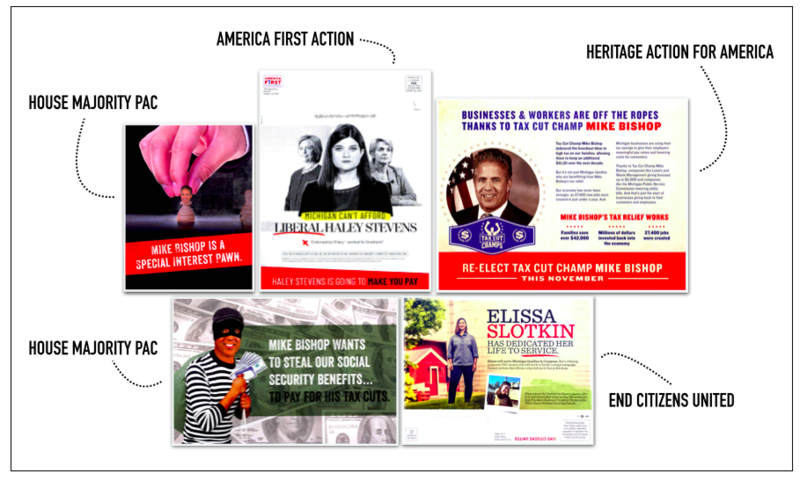 America First Action spent $1.3 million to benefit Rep. Mike Bishop, a Republican of Rochester, in the 8th District and $923,000 to benefit Republican Lena Epstein of Birmingham in the 11th District. The Congressional Leadership Fund spent $865,000 to benefit Bishop and $368,000 to benefit Rep. Fred Upton, a Republican from St. Joseph, in the 6th District. The following is a brief look at the 10 super PACs or PACs that spent the most money on Michigan’s 2018 U.S. House races. 1. Independence USA PAC spent $2.6 million to benefit Stevens and $2.4 million to support Slotkin. The super PAC received about $58 million from Bloomberg over the 2017-2018 election cycle, according to campaign finance disclosures. 2. The House Majority PAC spent $1.8 million to benefit Slotkin and $1.4 million to benefit Stevens. The super PAC supports Democratic candidates for the U.S. House. Its top donors over the last two years include hedge fund manager James H. Simons, who gave $6 million, and Newsweb Corporation Chairman Fred Eychaner, who gave $4 million. 3. America First Action spent $1.3 million to benefit Bishop and $923,762 to benefit Epstein. The super PAC works to elect candidates across the country who support President Donald Trump’s agenda. Its top donors have been Sheldon and Miriam Adelson, who have given $10 million, according to disclosures. 4. Change Now spent $1.5 million to benefit Democrat Matt Longjohn of Portage in his race against Upton. The super PAC was supported by the League of Conservation Voters and the Service Employees International Union. According to disclosures, it also received w88 dashboard$2.9 million from the nonprofit Sixteen Thirty Fund, which doesn’t have to disclose its donors and was active in Michigan ballot proposal campaigns last year. 5. Congressional Leadership Fund spent $865,000 to benefit Bishop and $368,000 to benefit Upton. The super PAC works to elect Republicans to the U.S. House. Its top donors include the Adelsons, who gave $50 million. 6. Women Vote! spent $576,828 to benefit Stevens and $531,994 to benefit Slotkin. The super PAC is connected to the organization Emily’s List. According to campaign finance disclosures, the super PAC raised $40 million over 2017 and 2018. Its top donors included psychiatrist Karla Jurvetson of California, who gave $5.4 million. 7. End Citizens United spent $919,009 to benefit Slotkin. The PAC wants to reverse the 2010 Citizens United Supreme Court decision. The PAC relied more heavily on donors who gave smaller amounts than the other PACs on the list did, according to campaign finance disclosures. 8. VoteVets spent $805,814 to benefit Slotkin. The organization says it works to give a voice to veterans. The PAC’s top donors included Bloomberg and a super PAC, the House Majority PAC. 9. The LCV Victory Fund spent $366,407 to benefit Slotkin and $103,002 to benefit Stevens. The super PAC was backed by the League of Conservation Voters. Its top donor, however, was Bloomberg, who gave $5 million, according to campaign finance records.